Description: This Deluxe sound system set includes a Pocket Rocker player, 2 working speakers, and a display stand with an amplifier. The Pocket Rocker players can be mounted on the display stand and connected to the two speakers, or carried individually via it's carry strap. 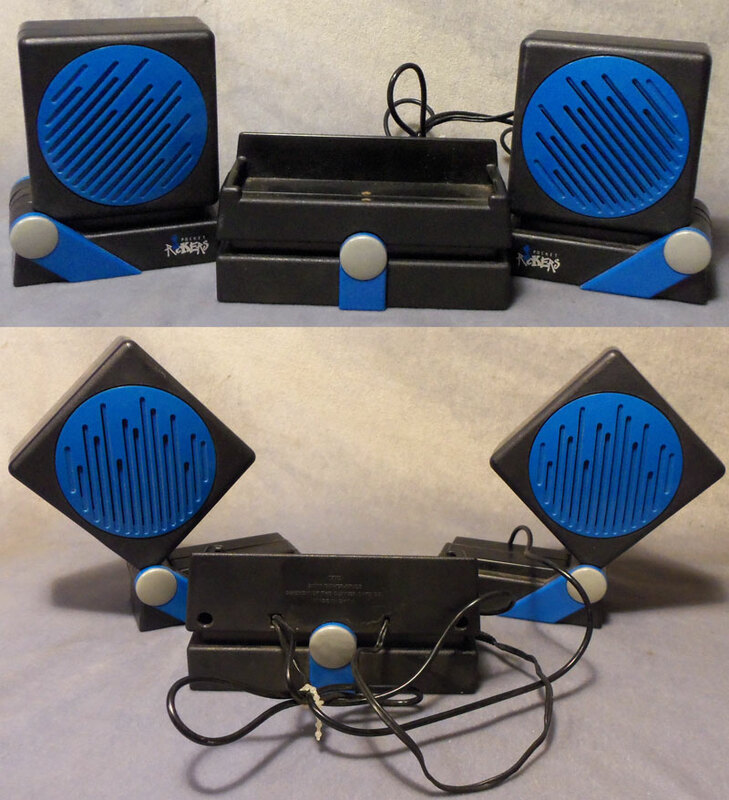 This set was sold with a Pocket Rockers mini-casette, trading music card, and a cassette belt clip. The player requires two AA-size batteries (not included). Designed for children ages 5 years and older. FPT19682 - Black Pocket Rocker Player with a blue speaker area and silver volume knob on the front right side. The front left side is marked "Pocket Rockers" in silver. The player has a black rectangular flap on top to insert a Pocket Rockers mini tape. The top also has a small silver knob to switch tracks. The side of the player has a blue knob to eject a Pocket Rockers mini tape and has a headphone jack. The back of the player has a belt clip and a battery compartment to place 2 AA-size batteries. Measures 4" wide, 2-3/8" high, 1-1/2" deep. FPT22461 - Small black rectangular Pocket Rocker player display stand with a built-in amplifier. The top of the stand has a rectangular recess to place a Pocket Rocker Player. The front of the stand has a silver circle with a blue bar under the dot. The back of the stand has a plug-in cable that attaches to a Pocket Rocker Player. The back also has 2 long black cables that connect to 2 small black speakers. Each speaker has a rectangular base and the speaker can tilt on the base to achieve a high-tech appearance. Each speaker has a round blue speaker area. FPT19190 - Short black braided rope carry strap with a metal piece on one end to form a loop and a metal clasp on the loop to attach to a Pocket Rocker player. Measures 7-1/2" long. FPT19542 - Small transparent yellow-tinted plastic storage case that holds the mini-cassette. Los Lobos - "LA BAMBA" and "TEQUILLA" - Small clear plastic cassette tape with 2 three-minuite popular songs. Mini tape is available in 6 colors. Measures 1-1/4" wide, 1-1/2" tall, 3/8" deep. FPT19192 - Cardboard trading card with the song titles and designs that match the songs and designs of the mini-cassette listed above. Measures 2-3/4" wide, 2-3/4" high. FPT19543 - Small white tri-folded instructions sheet for the Fisher-Price Pocket Rockers. Black print and pictures. Measures 4-1/4" wide, 5-1/2" tall. FP8741BOX1988 (Box ONLY) - Sold in a 14-1/2" long, 11" high, 2-1/4" deep display box. The 1988 Dealers catalogue shows this set with a mini-cassette marked "BAD" by Michael Jackson. The cassette has a cartoon picture of a shadow of a suspicious-looking man wearing a hat and trenchcoat. His eyes glow yellow, and there is a brick wall behind him. We do not know if this is the exact title that were sold with this set.